The government was today urged to fund the creation of 100,000 jobs in unemployment blackspots as a report revealed that joblessness in Britain's weakest local economies stands at 18%. Highlighting the challenge facing older industrial areas and run-down seaside towns at a time of austerity, the study found that the deep recession of 2008 and 2009 had brought an abrupt halt to the improvement in the jobs outlook for districts that had been left with a legacy of worklessness by the earlier slumps of the 1980s and 1990s. Research by Sheffield Hallam University showed that across Britain there are nearly 5 million men and women of working age who are out of work and on benefits. More than half, 2.6 million, are on incapacity benefits. "Prior to the recession, the numbers out of work on benefits were falling, with the biggest reductions in the areas with the highest claimant rates. The recession brought a halt to progress, and hit industrial areas the hardest," the study commissioned by the National Worklessness Forum found. It added that bringing the employment rate in the 100 worst districts outside London – home to a third of Britain's population – up to the level of the best third would require an extra 1.2 million people in work. The working age benefit claimant rate was highest in Blaenau Gwent at 26.7%, but was also above 20% in the 20 worst affected districts. By contrast, worklessness was 6% or lower in the 10 districts in the south-east with the best-performing labour markets. "Before the recession, employment was growing in Britain's weakest local economies, but more than 90% of the job growth was in the public sector," the report said. "This points to the difficulties of relying on a private sector led revival." The study noted that the loss of public sector jobs was likely to make the unemployment problem worse in Britain's weaker local economies. Ministers have admitted that the four-year programme of spending cuts announced last month will lead to the loss of 500,000 jobs in the public sector, with knock-on effects in private-sector employment. Today's report was sceptical about government claims that a rebalancing of the economy away from the public to the private sector, and from debt-driven consumption to manufacturing, will lead to an improvement in the employment picture across Britain. Other than spending more money we don't have what other solution is there but to cut back? The entire economy needs to be rebalanced back to what's affordable and that means creating a low cost economy where people can actually afford to buy goods without the need for an ever expanding credit card. People shock horror might have to make things last. Of working age people some 14% are disabled. have the govt actually definitively claimed it will improve across britain? I'm a realist.. and the reality is the modern private sector just doesn't generate many jobs. Actually the number of people employed by the private sector is in decline all around the industrialized world. Its not just a phenomenon in Britain, and it doesn't matter if left or right wing governments are in power. Imo if the Tories do decide to cut large numbers of government jobs, an equal number of people will end up long term unemployed. And because the private sector is always downsizing in this day and age, more will join them year by year. This reality has dystopian aspects. Because instead of free men earning their way based on the value they add, each year more and more people are simply becoming wards of the state. No matter how hard someone works they can never compete with an industrial robot or farm combine. I notice many people on the political right do not want to believe this reality is happening. So they increasingly block out reality. Very hard to claim it is something systemic and not an aspect mainly of the depression but also of government policies such as incapacity benefit in which someone can basically choose never to work again. Look at this graph of US employment ratios. 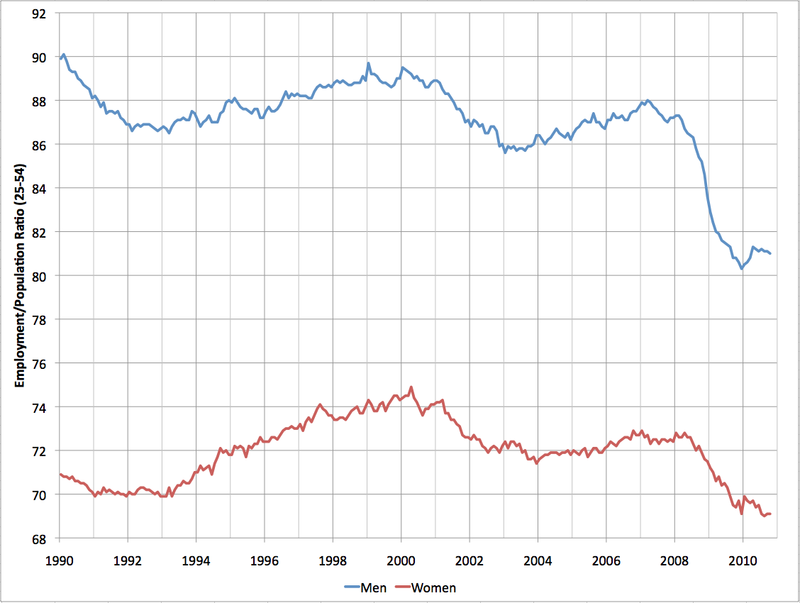 From 1990 to 2007 the male ratio dropped from 90% to 88% but the female ratio increased by a similar amount. Ok, maybe it took bubblenomics to keep the ratio up but I am not convinced that not enough jobs will be created. That chart is a good one, but it doesn't include two things. Firstly the vast expansion of government jobs. Secondly the marginilization of jobs. By marginilization imagine a guy who worked at an autoplant. And made good money, enough to support a family to a first world level. But now the auto factories only need a fraction of the old workforce and he was one of the people let go. Now maybe he works as a cell phone salesman and does not make enough money to remotely support a family. And only makes a few sales a week. By the statistics he is still employed the same as before.. but a big change has happened. If you look in the UK something like 15-20% of the private sector workforce was lost over the last decade. Labour covered it up by adding a few million govenment jobs, moving a few million onto long term benefits. Also things like earlier retirement and having kids stay in university longer and more going to university. Some one posted a few weeks back about the benefits of a cap of 30 hours to the working week. I did not agree initially, but having thought it through, its the way to gradually go. The future will most likely require less labour than the past, we are most unlikely to see full employment for all at 40 hours again. So lets share the work load and reduce benefit costs that way. Adding a million+ immigrants to the labour force to drive down wages and working conditions will come at a social cost not worth paying, this lesson has to be finally learnt. That plan also has worked in the past. In the Victorian era the standard was an insane 80 hour work weeks. 6, 12 hours days, and an 8 hour day on Sunday. By 1900 the industrial standard had moved to 60 hour weeks. 6, 10 hour days and Sunday off. In addition there was the abolition of child labour. Then in the 30's the industrial nations moved to the 40 hour work week. 5, 8 hour days. And added old age retirement. And over time more statuatory holidays had been added. And higher standards of annual vacation time. But its now been basically 2 generations since the work week was shortened. So the over crowded regions just get even more over crowded? Labour covered it up by adding a few million govenment jobs, moving a few million onto long term benefits. Also things like earlier retirement and having kids stay in university longer and more going to university. Also they( both governments ) quote figures stating the amount of people out of work and claiming JSA. 1.2 mllion people including me are unemployed with no benefits for various reasons. Plenty of the new jobs people are accepting are part time so small income still supported by benefits, but not classed as unemployed. The way i see it , without any protectionism measures being brought back the only manufacturing jobs that will be coming back to the UK will be government sponsored ones like the wind turbine programs. We're going to carry on losing them. Indeed the only reason manufactures' still employ so many people is that it's still cheaper to use slaves than machines. If forced to carry out this work in somewhere with high labour costs, they'll use machines. But then that's more or less irrelevant anyway, as not only do the costs have to be to equal China, so do the growth opportunities. Didn't the Spanish already take our wind turbine sector over? Not surprising really, I visit Spain a lot. Up high there are Wind Turbines pretty much everywhere. I remember that I visited Wales and someone was telling me that the Wind Turbines on the coast weren't built by British Engineers, but South African ones they brought in. Hell they want to build a 'Solar farm' near me, not going to be a British company doing the work instead it will be German. gave up hope for the future of the UK. One of the most terrifying things done by those running the economy is that during such a huge global boom the UK couldn't take up hardly any of the manufacturing opportunities available to compete and export and to help bring down claimant numbers and increase employment (outside of the public sector) for UK people. I've done a few 84 hour weeks at min wage. There really not that bad. You of course need some time off though, but half days are just as good as full ones. If only you could afford the car insurance to actually go somewhere nice in a reasonable amount of time!